Backyard looking tired and tatty? Friends coming for a bbq in a couple of days? In-laws expecting a lush landscape? Lost the kids somewhere in the foliage? If any of these things apply to you, it’s a landscaping emergency and, believe it or not, you can fix it in a couple of days. Set a weekend aside and we’ll help you along the way. If your garden is more weeds than plants, then rip it all out and start again. It’s the fastest way and can be achieved not on your knees, but upright with a hoe or a fork. Dig it all up, toss away the loose green stuff and mix up the remaining soil with a bit of fertiliser and you’re ready to start again. 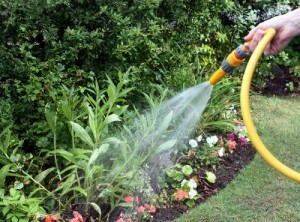 Spray the remaining earth (not your new plants!) with weedkiller to dissuade regrowth. Add a thick layer of mulch, ideally 100mm, and suddenly your weed bed will look like a fresh and spectacular garden bed. Keep an eye out for weed regrowth and pick out or spray with weedkiller as soon as you see it and this should keep the evil under control. Create an instant border for straight-edged garden beds with pine sleepers or split logs – they will keep mulch and plants in their place in the garden bed and you can mow right up to the edge, cutting down on whipper snipping. The beauty of pine sleeper is that no digging in is required, you simply lay them along the edge of your garden beds, and they will instantly make your garden look groomed. Giving overgrown bushes and trees a quick hair cut is one of the fastest ways of neatening up your garden. Winter is the ideal time to do it, although some plants prefer other times of year. If you care about your shrubbery, look it up – if you don’t, cut it back and anything that expires can always be replaced. Make a square or rectangle over a bare, or bare-ish, piece of ground, or grass, using two or three pine sleepers fastened together. Lay down a layer of newspaper or cardboard to prevent anything unwanted from growing up into your new garden bed. Tip in a good quality organic garden mix or organic vegetable mix to a depth of about 50cm. Plant! As above, but with flowers! Admittedly a bigger job, but if your grass is thin or consists of more weeds than grass, then it may be better to start again. Landscapers would never recommend this, but in an emergency, turf can be laid over existing turf for quick results. Just bear in mind that although weaker weeds may be smothered by the new turf, the stronger ones won’t take that long to grow their way back through. To do the job properly, but still relatively quickly, rent a rotary hoe to dig up your existing grass. (Ideally, spray it with herbicide a couple of weeks in advance, so it’s dead first). A rotary hoe will also loosen your existing soil, and a nice loose surface is what grass likes to root into. Spread 50mm of lawn builder over your soil to give your new turf some nutrients, water this in, and then unroll your turf. Bingo. A beautiful new lawn.